History: (What If? II#30/2) - When Susan Richards went to the hospital to have her second child, all was a success with mother and daughter making it fine. Susan and her husband Reed decided to name their new daughter Mary, after Sue's mother. 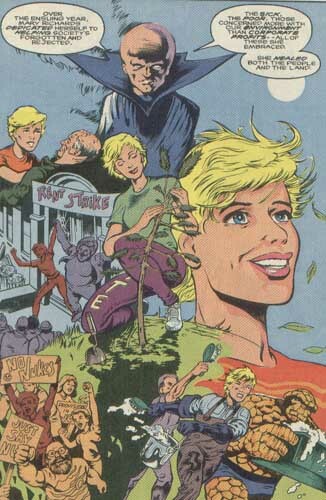 When Sue returned home to Four Freedoms Plaza and her duty to the Fantastic Four, Reed discovered that their had superhuman powers when she floated up to her mobile. As the years passed, Mary had a fairly normal childhood given her family until one day, she, her uncle Johnny, and the Thing were walking down the street when a girl's dog was hit by a car. Mary ran over to help the girl and found that she completely healed the dog of its injuries when she touched it. She eventually found that she could heal things with a touch and set out to do all that she could to help others. When Mary was at a hospital trying to heal the sick, she concentrated hard to keep going despite her exhaustion and due to her concentration, she managed to heal the entire hospital in a wave of light. As her crusade of healing continued, major businesses and the government began to take notice of her activities. 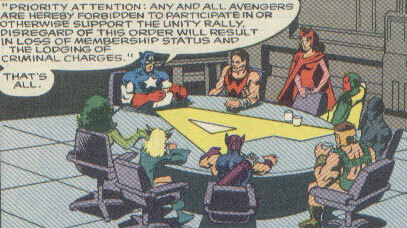 The U. S. government decided to send a communique to the Avengers warning them that none of them were to participate or support the Unity Rally started by Mary or they would lose membership status and be charged a criminal. Hawkeye angrily quit the Avengers in response, taking Mockingbird with him. Wonder Man then agreed with Hawkeye and quit himself. The Vision and Scarlet Witch followed suit, and were followed themselves by She-Hulk, the Black Panther, and finally, Hercules. After the dissolution of the Avengers, Henry Peter Gyrich met with an unknown person who explained that Mary needed to "retire," to which Gyrich explained that he was the right man for the job. At the Unity Rally, while Mary Richards was speaking, "Captain America" walked onto the stage and stabbed Mary with a knife. As the F. B. I. arrived to arrest "Captain America, ""Cap" grabbed a microphone and yelled that Mary's movement would destroy the American way of life and that it must be suppressed. With those words, the rally erupted into a riot while Iron Man tried to quell the violence. The violence was stopped when Mary Richards floated into the air and projected a wave of energy from herself and then fell from the sky, where she was caught by the Human Torch. Two weeks after the events at the Rally, Mary Richards awoke from a coma and found that those touched by her healing wave of energy ended their riots peacefully and came to the hospital for a vigil. After Mary fully recovered, she led the movement that eventually shaped a new United States of America, one truly of the people, by the people, and for the people. Much later, Gyrich sat at his office holding a Captain America costume and talked to himself about how he did everything according to the detailed plan and that when he stabbed Mary, she should have died. His monologue was interrupted by the arrival of the real Captain America, who broke the lightswitch when he flipped it on. Cap then slammed the door as Gyrich panicked. Captain America stared at Gyrich and whispered that he shouldn't even bother getting up. Comments: Created by Ron Marz, Rurik Tyler, and Ian Akin. 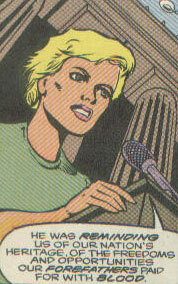 This reality diverged from the events in Fantastic Four I#267 (June, 1984). The Thing should not have been present at Mary's birth unless this reality diverged prior to the Secret Wars. The Avengers were, for the most part, the same as their Earth-616 counterparts up until the government ordered them not to participate or support Mary Richards's Unity Rally. In response to the government's orders, nearly all of the Avengers quit the team and the Avengers were eventually disbanded. Their roster was (counter-clockwise from upper left): Captain America, She-Hulk, Mockingbird, Hawkeye, Hercules, Black Panther, Vision, Scarlet Witch, and Wonder Man. Mary Richards was the daughter of Reed and Sue Richards of the Fantastic Four. As an infant, she was able to float in the air and as she aged, she discovered that she could heal things around her, be they human, animal, or land. She took to using her powers as a healer and activist, eventually gaining notice from government officials who tried to kill her by having her stabbed at her Unity Rally by a Captain America imposter. She recovered and led the United States into a new age of peace.